Bitcoin just made new bear market records! Bitcoin has broken a great majority of all of its bear market records. This is the single longest down move in its history. But not all is doom and gloom here – a change is around the corner. Unless something changes in the next 3 hours, Bitcoin looks to close the month of January lower than it’s open. This will mean that Bitcoin has been in a downtrend for the longest consecutive month period in its entire history. The record for the longest consecutive bearish monthly closes was over 8 years ago when Bitcoin traded lower each month from June 2011 to November of 2011. And between that time and now, there was one 4-month long period of lower monthly closes in 2014 from July 2014 to October 2014 – that was during the Mt. Gox debacle. Not only does this historical move exceed all other consecutively lower monthly closes, but it also creates a new lifetime record of months where the high a month has failed to match or exceed a prior month’s high. January 2019 represents the 7th consecutive month where the high of the month has failed to meet or exceed the prior month’s high. This previous record was held back on the same June 2011 to November 2011 – but it was only a 5-month period. This strength and longevity of these trades have been remarkable, for any market. It is very strange for there to be such a strong and persistent move without any significant corrective behavior in a 6 to 7 consecutive monthly period. But Bitcoin isn’t alone in sharing this… honor. Ethereum experienced 7 consecutive months with a monthly close lower than its open. That move lasted from May 2018 to November 2018. December 2018 did have a higher close, but it was almost negligible. January 2019 looks to close lower for Ethereum as well. And Litecoin experienced 8 consecutive months of lower monthly closes – and if could possibly extend this record to 9 months if Bitcoin fails to close above its monthly open. When looking at the various measure of the momentum of this move, we can see that the monthly Composite Index reading for Bitcoin is the lowest in its entire history. In fact, there’s a strong hidden bullish divergence between price and the Composite Index and price as well as between the RSI and price. Both the RSI and the Composite Index have printed new extreme all-time low levels on their respective indicators. So is there any bullish outlook to be had? Certainly. We are approaching the end of the 700-day cycle – a cycle that indicates an end to the bear market and the beginning of an accumulation move that would last over 700 days. When we measure the time from the Mt. Gox all-time high to the lowest low before its expansion (the one that leads to the 2017 high), it lasted 59 weeks, or 413 days. If we measure that same time distance from the new all time high in December of 2017, then 413 days ends this week. It will be very interesting to see what happens over the next two months. 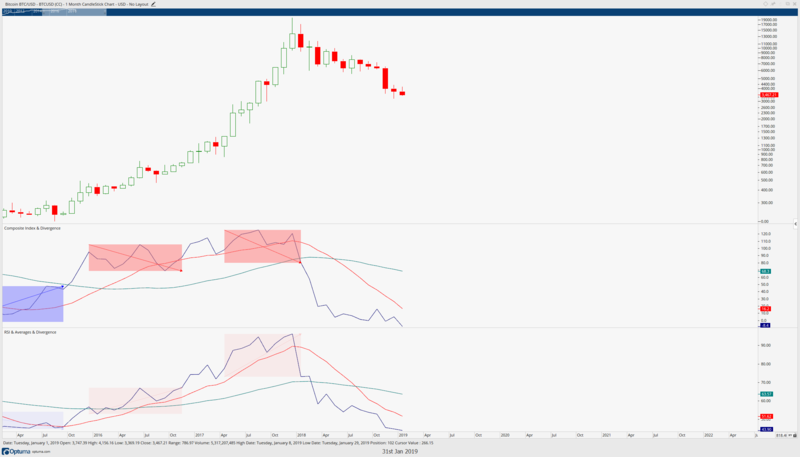 Ideally, we would see February at least create a condition where we have a high that exceeds the January 2019 high and ideally we would have a February or March where the close of the month is higher than the open. This is a very strong probability given the very simple but extremely powerful 180-day Gann cycle – which frequently turns markets into new trends.